The new CQ Loyalty scheme has now been launched in conjunction with a brand new website for the Cathedral Quarter BID. 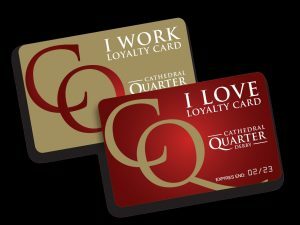 The loyalty scheme is card-based with a CQ I Work card for people who work in the Cathedral Quarter and a CQ I Love card for everybody else. The I Work card is free whilst the CQ I Love card costs £5. The CQ loyalty cards get you access to offers and discounts at a large number of Cathedral Quarter businesses. Applying for the cards is easy – simply follow the instructions for the appropriate card and once complete this will be delivered within ten working days. To apply for your card or to see a listing of the current offers available, please click here. To use your card and to benefit from an offer, simply show your CQ I Love or CQ I Work card to the business at time of purchase. You can view the current offers available by scanning the QR code on the back of your card with a smartphone. You can read the full terms and conditions for the Cathedral Quarter Loyalty Scheme by clicking here.